Training the cobot involved a mock-up of the Miracle Tools America Workstation. Dirty tools are placed on a lower table. 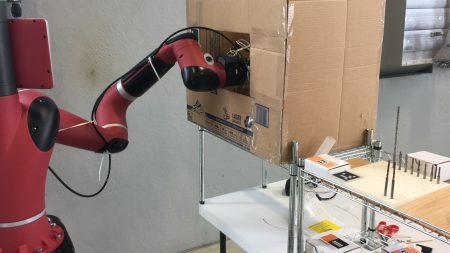 Sometime early next year, Miracle Tools America intends to begin using a collaborative robot to save time for its human workers and make the overall plant more productive. 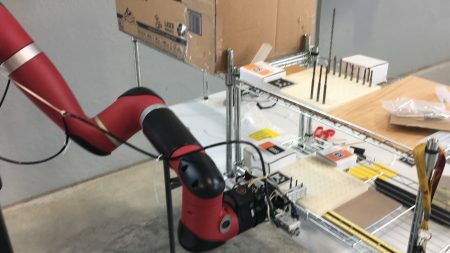 The “cobot” is being installed after an untrained CIRAS engineering student – someone with no particular expertise in robotics – spent three months learning how to program it and make it do what Miracle Tools needed to be done. Miracle Tools bought the robot earlier this year, shortly before an engineer who had championed the project left the company. The machine sat unused until DeBarr agreed to an experiment: CIRAS hired McKinley Spading, a senior majoring in mechanical engineering at Iowa State University, to program the machine and get it ready for duty. Next, the dirty tool is inserted into a mock water nozzle. The machine, which spent much of the fall in a tiny corner of the Iowa State University Research Park, could be up and running in Davenport within weeks. For DeBarr, the introduction of cobots is a normal outgrowth of Iowa’s longstanding workforce shortage. He estimates that Miracle Tools America employees currently spend a combined 40 to 50 hours per week simply walking over to a designated workstation and blowing the gunk out of what they’re trying to produce. Once the cobot comes online, that task will stop with setting tools in front of the cobot and pressing its arm as a signal to get to work. Finally, the cleaned tool is returned. 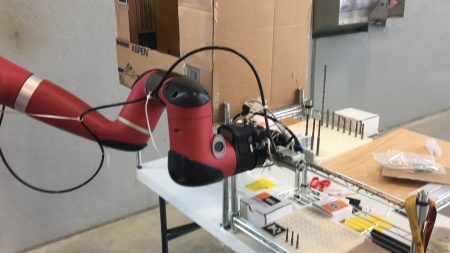 For Spading, the project proves that modern industrial robots live up to their billing in terms of being cheaper and easier to operate than ever before. To provide that assistance, CIRAS has plans early next year to open a Digital Manufacturing Deployment Facility in the ISU Research Park. The program is intended to serve as a lab where Iowa businesses will be able to experiment, perfect their approaches to new technologies, and learn how to become more productive. The first phase facility will involve helping companies learn to use cobots for performing basic and repetitive tasks. For more information, contact Mike O’Donnell at modonnll@iastate.edu or 515-509-4379.